When Hall of Fame infielder Rogers Hornsby was asked what he did in the winter without the national pastime, he reportedly answered, "I stare out the window and wait for spring." Sure, anyone could do that. And while staring, you could reflect on the last few games you watched and think about how more baseball is right around the corner. The same is true when it comes to prospects. Some of the Minors' best late-season performers of 2018 aren't household names yet, but they've given us plenty to think about while we look out our windows. This edition of the Toolshed revisits hot performances by players who aren't yet on MLB.com's Top 100 Prospects list, and evaluates what that means for those Minor Leaguers as Opening Day 2019 draws near. 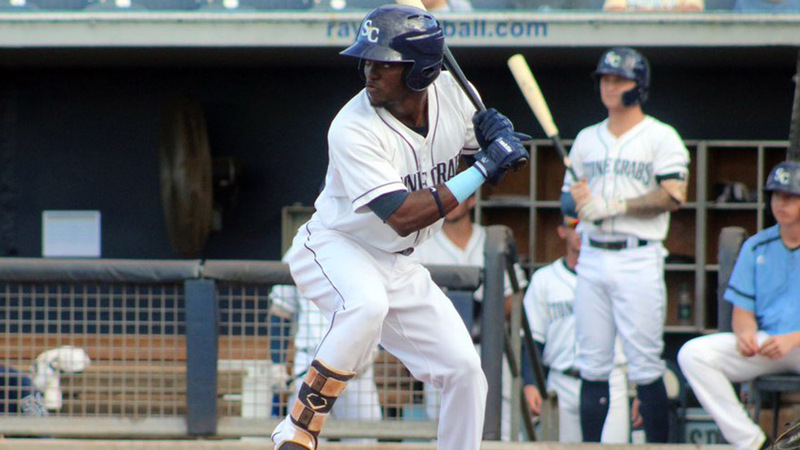 Vidal Brujan, second baseman, Rays: Tampa Bay's system is among the deepest in the game, and Brujan is a prospect who would be the talk of other organizations but checks in at No. 12 among Rays farmhands. That ranking is likely to change because the 20-year-old switch-hitting second baseman took off in the second half, particularly following his Aug. 6 promotion to Class A Advanced Charlotte. Brujan batted .347/.434/.582 with 13 extra-base hits, 12 stolen bases and as many walks as strikeouts (15) over 27 games in the pitcher-friendly Florida State League. His 190 wRC+ was fourth-highest among the 494 batters with at least 100 plate appearances at Class A Advanced in 2018. It's a small sample, sure, but given Brujan's plus-plus speed and ability to recognize stuff in the zone, he didn't come by those numbers cheaply. A return to Charlotte seems likely coming off his first full season, but he may not be in the Sunshine State for long if he picks up where left off. Jazz Chisholm, shortstop, D-backs: After missing much of 2017 with a torn meniscus, Chisholm entered the 2018 season as the No. 3 prospect in a lowly D-backs system and ended it in the same spot. But the way he closed out the year with Class A Advanced Visalia and in the Arizona Fall League, the shortstop should be in the Top 100 conversation. His most notable achievement was a power jump that resulted in 25 home runs, and he belted 10 of those in 36 games with the Rawhide. He batted .329/.369/.597 over 160 plate appearances, and while it was indeed in the hitter-friendly California League, there were only three batters on the circuit with 150 or more plate appearances who had a higher slugging percentage. Chisholm also hit .442/.489/.767 with three homers in 10 games in the Fall League, showing his uppercut swing could play outside the Golden State. Whiff rate could keep Chisholm from vaulting into the upper echelon of shortstop prospects as he turns 21 going into 2019, but it's hard not to be excited about a player at that position who can smack 28 home runs in a calendar year. Luis Garcia, shortstop, Phillies: Garcia was sent to the Rookie-level Gulf Coast League less than a year after he signed for $2.5 million out of the Dominican Republic, and he kept getting better as he got more comfortable stateside. The teenage switch-hitter had multiple hits in six of his last eight games with Phillies West and finished with a .388/.468/.522 line over 18 games in the season's final month. His .369 average led the complex circuit, and it wasn't particularly close; Red Sox outfielder Juan Carlos Abreu was second at .351. There wasn't much overall power behind that average -- only 15 of Garcia's 62 hits went for extra bases -- but for a player who was thought to be defense-first entering 2018, the Phillies' No. 14 prospect showed enough with the bat to make some think, in time, he could be an all-around talent at a premium position. He'll be 18 for all of 2019, and it'll be telling if Philadelphia pushes him to a full-season assignment right away. Nick Pratto, first baseman, Royals: The rigors of a first full season are supposed to wear down young Minor Leaguers, yet Pratto only got better as 2018 rolled along. The 2017 14th overall pick's stock took a fairly big drop after he entered August with a .252/.313/.381 line, eight homers and a 99 wRC+ over his first 96 games with Class A Lexington. But from Aug. 1 on, he hit .367/.430/.633 with six homers and a 199 wRC+ over 31 games. That doesn't include his performance in the South Atlantic League playoffs, when he went 7-for-21 (.333) with two homers and six walks over six games to help the Legends capture the championship. First basemen need to hit if they're going to provide value, and Pratto wasn't impressive at the dish early on. The fact that he adjusted as well as he did should be cause for optimism and will make his move to Class A Advanced Wilmington all the more interesting. Time will tell whether those numbers were the result of effective adjustments or just a small-sample mirage. Bryan Abreu, right-handed starter, Astros: Strikeouts make a pitcher stand out anywhere in pro ball, and few hurlers were more efficient at picking up K's down the stretch than the Astros' No. 10 prospect. Abreu struck out 37 of the 83 batters he faced from Aug. 1 on with Class A Quad Cities. That 44.6 percent K rate tied with Dylan Cease for tops over that span among MLB.com's ranked pitching prospects. The 21-year-old righty kept up that high rate while shifting roles; after he'd made three starts in nine appearances entering the month, four of his five August appearances were starts. Abreu earns plus grades for his fastball and curveball, and those two pitches alone were good enough to keep Midwest League batters guessing. He also improved his control dramatically, going from a 6.4 BB/9 in the Appalachian League in 2017 to a 3.8 between the Midwest and New York-Penn Leagues last season. Abreu will need to develop his slider and changeup if he's going to stick as a starter, but the K's he collected in 2018 (90 over 54 1/3 innings) will earn him longer looks. Deivi Garcia, right-handed starter, Yankees: The knocks against the Yankees' No. 11 prospect always come down to his 5-foot-11 frame. But he stood pretty tall in the final weeks of 2018, and he should be one of the organization's most electric hurlers heading into 2019. The 19-year-old righty was promoted from Class A Charleston (where he had a 3.76 ERA and 63 strikeouts in 40 2/3 innings) to Class A Advanced Tampa on Aug. 6 and absolutely took off at the higher level to earn a one-game look at Double-A Trenton for his final start. Over his last outings between the Tarpons and Thunder, the Dominican Republic native posted a 0.94 ERA and a 0.84 WHIP with 35 strikeouts and seven walks over 28 2/3 innings. Put another way, he struck out 32.7 percent of the batters he faced, walked 6.5 percent and held opposing batters to a .170 average. In that lone Eastern League start on Sept. 2, he fanned seven Reading hitters and did not allow a single hit over five frames. That's called leaving an impression. Garcia's 74 innings were a career high, so he still doesn't have a tremendous amount of experience on Minor League mounds. When he has been out there, he's shown the low- to mid-90s fastball and high spin-rate curveball to keep hitters off balance consistently. If he can keep up that stuff for 100 or more innings this season, people won't be talking so much about his height. Travis Lakins, right-handed reliever, Red Sox: It's no secret the defending World Series champions won't have the same firepower in the bullpen this year. Joe Kelly signed with the Dodgers, and while Craig Kimbrel remains on the free-agent market, president of baseball operations Dave Dombrowski said he doesn't expect the team to spend much on a closer. If things stand, the club will need help from internal options. Lakins did enough at the end of 2018 to not only grab a 40-man roster spot, but set himself up to earn a ticket to the Fenway Park 'pen at some point this summer. The No. 15 Red Sox prospect held opposing batters to a .153 average and allowed 14 batters to reach base in his final 11 appearances (16 2/3 innings) with Triple-A Pawtucket. He posted a 0.54 ERA with 15 strikeouts and three walks in that span. Lakins was equally tough against right-handers (.195 average, .549 OPS) and left-handers (.183, .560 OPS) throughout the season between Pawtucket and Double-A Portland. This was the 2015 sixth-rounder's first season working full time as a reliever after dealing with elbow stress fractures earlier in his career, and the results were encouraging as he showed above-average pitches in his fastball, cutter and curveball. Minor League relievers need to be dominant to stand out and push their way to the Majors, and Lakins certainly was toward the end of 2018. Joe Palumbo, left-handed starter, Rangers: The Rangers' No. 8 prospect made three starts in 2017 before undergoing Tommy John surgery, so a healthy 2018 was what mattered. But by August, he showed he was capable of doing more than avoiding another extended stay on the disabled list. After returning to the Minor League mound in late June, he took his share of lumps before finding his stride in the final month. Over his last four starts, the 24-year-old southpaw posted a 0.92 ERA with 30 strikeouts and six walks in 19 2/3 innings split between Class A Advanced Down East and Double-A Frisco. He struck out 40 percent of opposing batters while holding them to a .149/.164/.240 slash line in 75 plate appearances. There were also reports of him hitting the mid-90s with more regularity in August. With the procedure and year of recovery behind him, Palumbo is likely headed back to the Texas League, and it's not out of the question that he could move quickly if he echoes that late-season performance in April, especially since he's been on the 40-man roster since November 2017.